It's about time I started baking cookies, and I need a little help. Meet my assistant ~ Chef Gingerbread. this will give y'all a nudge! easy to pump it up for the holidays. Christmas is tucked into every little spot. brings us right into this joyful season. while watching a Christmas movie, or two or three! business of the Christmas season. Thank you so much for stopping by! I love all dogs, but terriers and retrievers are very special to me. Terriers ~ like our Bentley, are feisty, fun, tenacious, and loving. There is never a dull moment with a terrier in the house. loving. They love everyone, even the family cat! one on our breakfast room table. 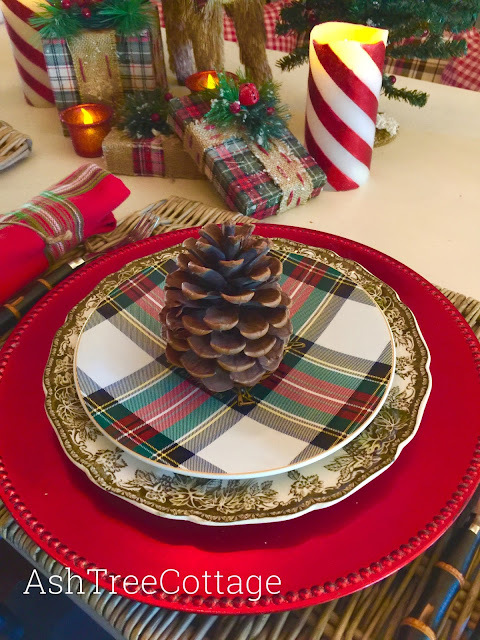 The pinecones are from our property up in the mountains of Idaho. I purchased these rustic scene tags up in Idaho too. breakfast room it is a cozy and wintry woodland setting. of pink decor whenever I am out shopping for the season. looking Santa, a white tree and some tiny ornaments to set off the scene. This little display is sitting on the window seat. from my childhood. The gingham. pitcher is filled with sparkly snow balls. Here is another one of those trees next to a little miniature scene. vignettes all around, my studio is a very festive place to be. decorated in the past. I'm so anxious for it to arrive! love it when friends come to call. Let's start in the kitchen and work our way around to the dollhouse. Here's a cozy spot to read a magazine. to spend the night in the dollhouse. the back porch, but here is what's happening on the potting sink counter. I hope our Cardinals come back home soon. We miss them. much for taking time out of this busy Christmas season to stop by. I so appreciate your visit. 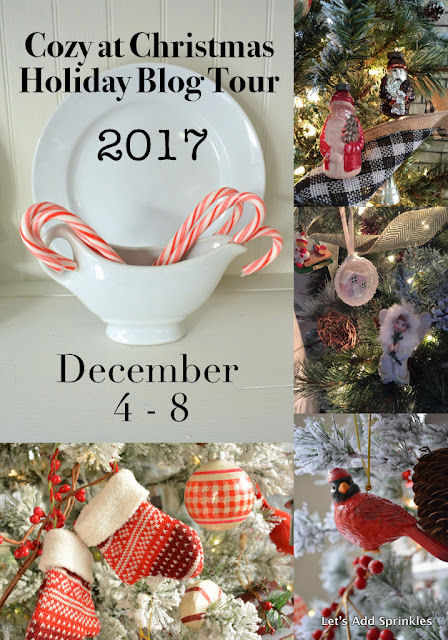 Today is the last day of the Cozy at Christmas Holiday Blog Tour. I want to thank Katie for organizing this for us and for you too. Let's give her some much deserved kudos!